The Soyuz rocket is raised into a vertical position on the launch pad, Monday, March 19, 2018 at the Baikonur Cosmodrome in Kazakhstan. A pair of U.S. astronauts and one Russian cosmonaut are just two days away from launching on a 50-hour, 34-orbit flight to the International Space Station. 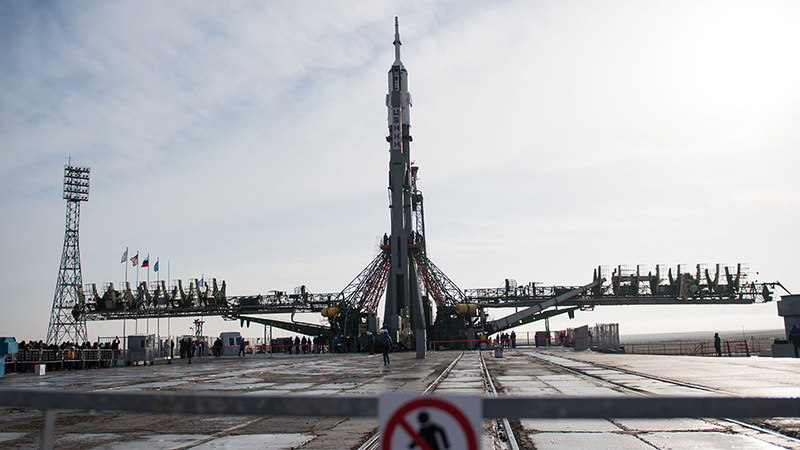 Flight Engineers Ricky Arnold and Drew Feustel will flank Soyuz Commander Oleg Artemyev inside the Soyuz MS-08 spacecraft and blast off Wednesday at 1:44 p.m. EDT from the Baikonur Cosmodrome in Kazakhstan. The Soyuz rocket that will shoot the new Expedition 55-56 trio to space rolled out to its launch pad early this morning. A train slowly hauled the rocket, as it laid horizontally on its side, from the processing facility to its pad where it was raised vertically for servicing ahead of its launch. All three crewmates are veteran space-flyers and are due to arrive at their new home Friday when they dock to the Poisk module at 3:41 p.m. NASA TV will broadcast all the launch and docking activities including the hatch opening and crew greeting ceremony live. Waiting for them onboard the orbital laboratory are Flight Engineers Scott Tingle and Norishige Kanai and Expedition 55 Commander Anton Shkaplerov who have been living in space since Dec. 17. The orbiting trio continues to ensure the station is flying in tip-top shape while conducting advanced space science to benefit humans on Earth and in space. It still angers me that we STILL have to rely on the Russians to get into orbit. The sooner we have our own launch vehicle the better!!! We should have had a space ship ready before we retired the shuttle!! Even though I’m not an American, I principally agree with you. However, the shuttle was waaay too expensive to operate. Even though it hurts me to say this because I really, really liked that spacecraft, they should’ve retired it earlier and put the money into development of the SLS. Probably Congress wouldn’t have let them, but cost-wise that would’ve been way better. I really, really liked the shuttle, and I often find myself looking at launches, but it turned out to be a too money-hungry spacecraft. Now SpaceX is making good progress. Let’s see what they can do. P.S. : try to turn your anger into positively pushing things forward. That way, it isn’t just anger, but something useful, everybody wins, and you can be proud because you achieved something that others didn’t. America is on the verge of having its own capability once again and has successfully integrated commercial partners within it space facilities. I think its an excellent basis to move forwards. In this period where America relies on their Russian partners, try to think of it as a shining example of international cooperation which can help bring nations together. Scientific endeavour sometimes rises above politics and that’s a good thing. Well, we do have SpaceX, if that counts. In this time of heightened tensions over elections and participations in the Middle East involving our two countries, the cooperation involving ISS might be the ‘balm’ that keeps things in check between us. Also, while the shuttle program could probably have continued for several more years, it’s retirement has spurred the development of flight vehicles by civilian companies, something that, while late, was, and is, necessary for continued US involvement in space exploration. Russia may do the personnel delivery and retrieval, but resupply missions are increasingly being handled by Space X, with projected involvement by Boeing and other companies. Both nations, along with others in the ESA, Canada, and Japan, are all pulling their weight in keeping ISS a truly international venture. Great to observe the continuing co-operation between the nations with differences, joined together, to Enrich the Life in earth, by doing research away from earth. Let this continue to lead more peace and joy and research and no war in the world. My best wishes to the Space community for their team work. you inspire me to look up at the stars.